The Smarter Sentencing Act (S.1410) is a bipartisan bill sponsored by Senators Richard Durbin (D-IL) and Mike Lee (R-UT), and it is currently co-sponsored by 32 US Senators. The bill does not repeal any federal mandatory minimum sentences, but instead reduces prison costs and populations by creating fairer, less costly minimum terms for nonviolent drug offenders. The bill passed the Senate Judiciary Committee on January 30, 2014. It has a House companion bill, H.R. 3382, with 50 House representatives as co-sponsors. Save billions on the incarceration of non-violent drug offenders. While it does not call for the repeal of mandatory minimum sentences, it does reduce them. 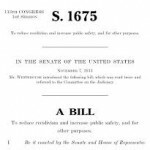 The bill slightly expands the federal “safety valve” for drug offenses, allowing offenders an additional criminal history point when qualifying for inclusion in the safety valve program. The Smarter Sentencing Act will allow for 8,800 federal prisoners currently incarcerated for crack cocaine offenses to have their cases heard again, to correct the disparity in sentences for powder and crack cocaine. This would have a significant effect on the African-American population, as they make up 87% of inmates currently serving sentences for crack cocaine. S. 1410 will address overcriminalization, requiring the Department of Justice and other related agencies to compile, and make publicly available, lists of all federal laws and regulations, their criminal penalties, and the intent required to violate the law. The fifth point is a contentious one: creating 5-year minimum sentences for sexual abuse and terrorism offenses and a 10-year minimum for interstate domestic violence. However, Victims’ Rights groups oppose these measures, arguing that such strong sentencing will prevent victims from speaking up and reporting crimes.